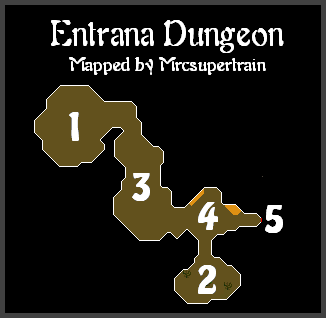 Entrana dungeon plays a major role in the Lost City Quest, but it really has no other use. This will be explained later. In this dungeon, you can find Greater Demons, Zombies, the infamous Dramen Tree, and more. 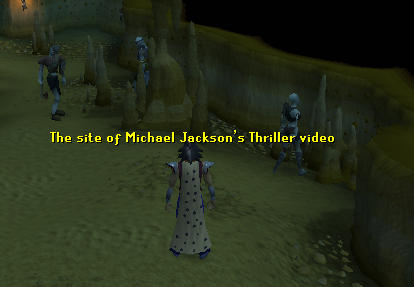 The Entrana Dungeon is located on the island of Entrana, so you'll need to board the boat from Port Sarim to get there. The trip is free, but you cannot bring any weapons or armor onto the island. Although, you can bring jewelry, robes, hats, fun items (like Rubber Chickens), Runes, and items to make weapons such as arrows and leather armor. The dungeon itself can be found on the northwest corner of the island. You'll be warned before you go down there, as it can be dangerous if you're not prepared! 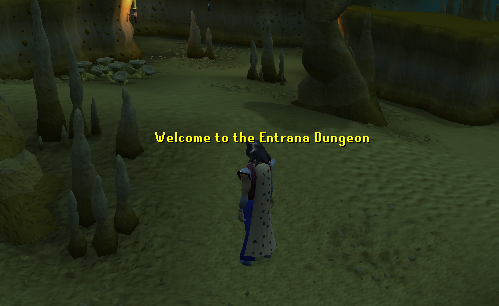 This is the entrance to the dungeon from Entrana. There is a ladder down but no way to get back up, as the monks prayers cannot hold back from the evil within. 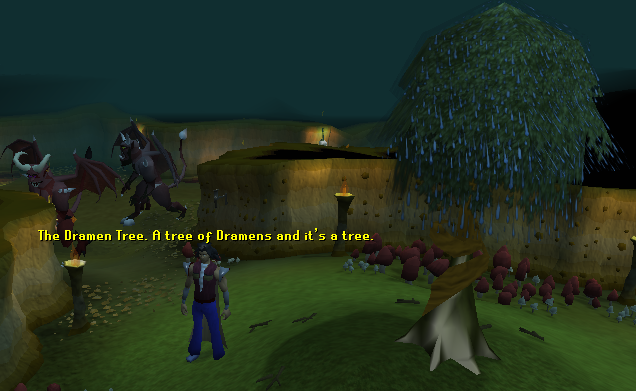 This is where the Dramen Tree is located which you have to cut in the Lost City Quest. When you cut the tree, a level 175 Tree Spirit will appear. The spirit can easily be ranged or maged from some cover, however you remember you cannot bring weapons onto the island. You will have to make on the island yourself before attacking with magic or range. This is where the level 42 Zombies are. You must kill one in order to get an axe to complete Lost City Quest. There are about five zombies in this area. This is the greater demon lava cave. 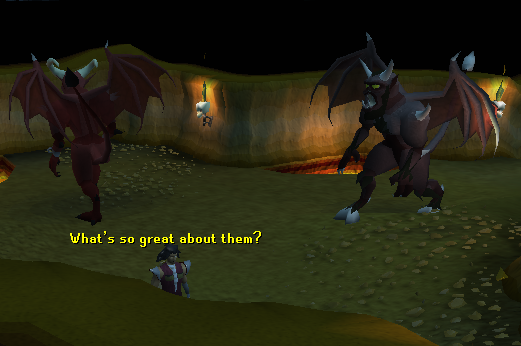 There are two level 118 greater demons but this is not a popular place to kill them as you can't have any weapons on the island. 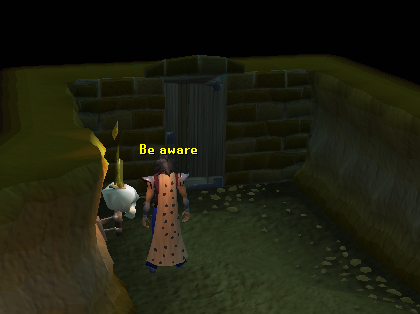 This is the wilderness teleport door and the only exit from the cave, but no one tends to use it as you usually just teleport out. 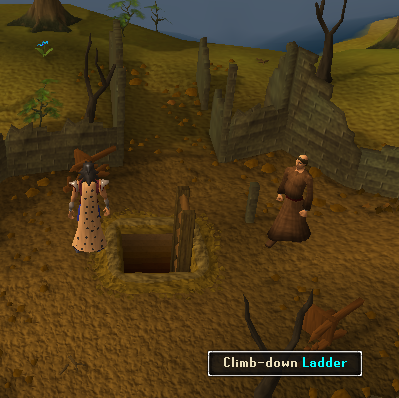 It teleports you to the middle of the wilderness at around level 26-27 Wilderness near the Graveyard of Shadows, however you may end up even further out, so take caution!